I have been very busy this year with my last year of school, and I know it has been a while since I last posted. I promise that I will begin posting again very soon, but in the meantime, I thought this guest post would be a great addition, especially before Valentines Day. I make a lot of tiered cakes for More Sprinkles, so it is great to hear Cathy Adams’ thoughts and tips on tiered cakes in this post. Bakers usually practice for hours on flat cakes, piping messages, flowers, and designs for friends and family. As they become more skilled and get used to different piping methods, and learn to work with other decorating techniques such as using fondant and sugar flowers, they move on to cakes of different shapes. But once they feel that they’ve conquered the basics of cake decorating and are ready for the next challenge, they move on to attempting stacked cakes. These cakes, tall and looming, are the mark of a professional baker. With so many surfaces to work on, stacked cakes pose one of the biggest challenges to both amateur and professional bakers alike. But when executed properly, the results are extraordinary, especially for themed parties, and those birthday cakes for close friends. 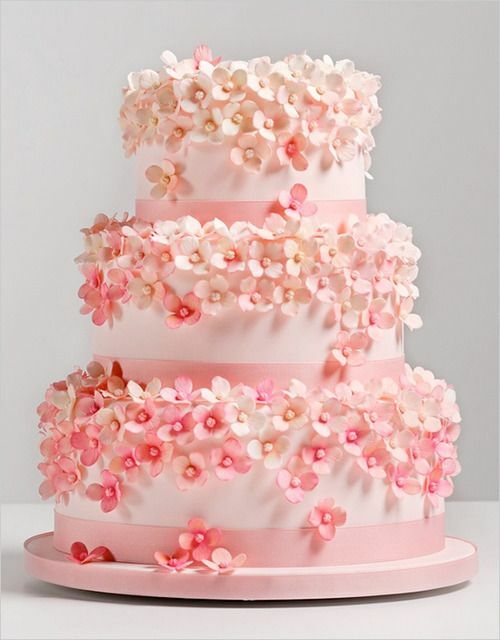 Here’s a great example of a beautiful pink floral wedding cake from The Wedding Chicks. 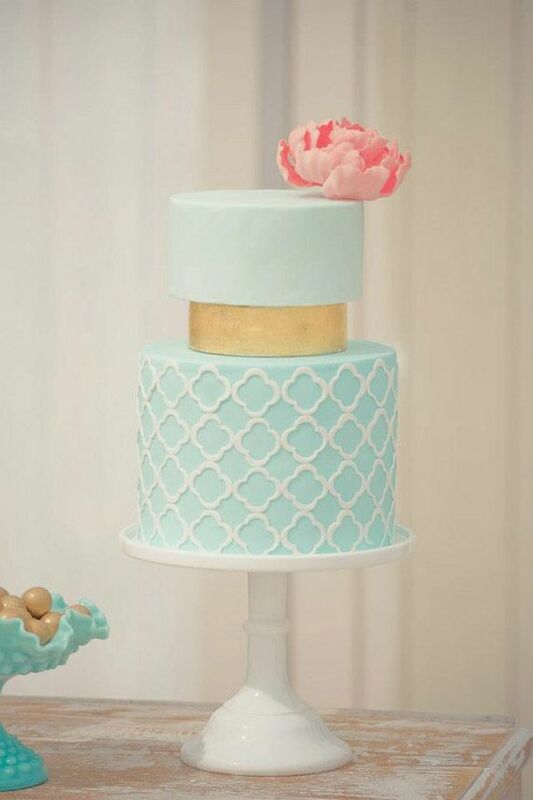 An elegant icy blue tiered cake by Studio Cake. A ruffled heart tiered cake, perfect for Valentines Day, by Style Sweet CA. The biggest problem with tiered cakes is finding a way to stack each tier without the whole thing sinking into itself from the weight. Luckily, Wilton has a great guide on how to stack cakes using wooden dowels (with pictures! ), so it’s easy to get those layers stacked up high. Ali Rodham, product developer with M&S, has also released a video tutorial for stacking cakes with the help of dowel rods. Tiered cakes are a great way to add personality and fun to your cakes. Not only is it a test of baking skill, but it also helps you cater to a bigger group of people, since you can make each level of cake a different flavor. Just make sure you estimate the weights of the cake right, and stack them accordingly — stacking a fruit cake on top of a sponge cake will make for a sad, disappointing, lopsided cake, with or without dowel rods. But the most important thing to remember is to have fun, and stay creative! You’re the painter, and the cake is your canvass — put your personality into every design you create.